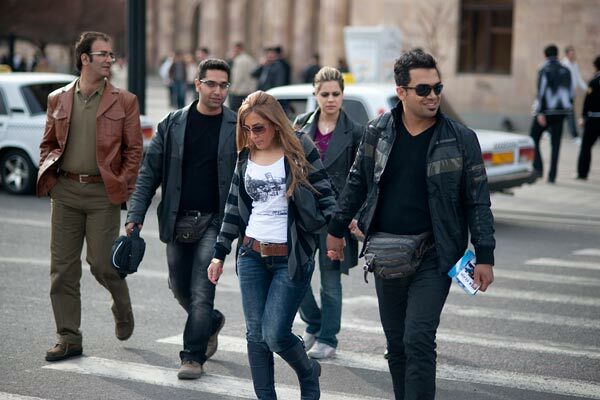 Groups of Iranians walking around Yerevan streets with families or in the company of friends is a sight heralding Nowruz, the Iranian New Year, marked at around the vernal equinox time. Like every March over the past few years thousands of Iranians choose to observe their holiday in Armenia. The holiday usually begins on March 20 and continues for ten days. Isanfur Menohil, an airline company worker, had arrived in Yerevan from Tehran together with her relatives. She says that for Iranians it is becoming a tradition to celebrate Nowruz abroad. She says they chose Armenia following the advice of their friends who spent Nowruz in Yerevan last year. “Prices are very affordable, unlike they are in Tehran. Besides, life here is more ‘open’; we can go around here without headscarves and it is also quite an experience for us,” says the young woman. According to head of the Armenian Economy Ministry’s Department of Tourism Mekhak Apresyan, as many as 20,000 Iranian citizens visited Armenia during the Nowruz period in 2010, their number in 2009 during the same period was 8,700. This year, some 28,000 are likely to have spent their Nowruz in Armenia. “From year to year the number of tourists visiting Armenia from Iran is observed to grow. Last year a total of 140,000 citizens of Iran crossed the border into Armenia. And 70 percent of such visitors are families. They also visit our historical and cultural monuments, and even complain that information panels at such sites are not available in Persian,” says Apresyan. Apresyan notes that this year efforts are made to exclude complaints from Iranians visiting Armenia. Last year they made some complaints regarding the quality of some services, and especially high charges for taxi services. Huyan Olipur, a 29-year-old student at the Yerevan Engineering University, has been in Armenia for five years. This year he has some guests from Iran on the occasion of Nowruz. He says his friends complain especially about taxi drivers, who take advantage of their being foreigners and charge more for their services. Abbos Zakhari, 28, from Isfahan, visiting Yerevan together with his friends for the first time this year, says that he followed the advice of his sister, who was in Armenia for Nowruz in 2010. “Soon I will open my own travel agency in Iran, and in the future I plan to recommend this country for travels. Armenia is beautiful, but I think some services need improving,” says Zakhari. He notes that drivers and traffic policemen in Armenia usually do not speak English, which limits tourists’ contacts, and that there are very few information panels, which complicates travel. According to expert Tigran Davtyan, nearly 300 million people in the world observe Nowruz. “Iranians prefer spending their holidays in Armenia because in their country it is banned to listen to a variety music and drink alcoholic beverages. Besides, both countries have good-neighborly relations and a streamlined visa regime,” says Davtyan. Iranian tourists also confirm that in Armenia they have an opportunity to listen to singers they like, such as Andi, Kouros, Leila, and others. Expert Davtyan says that Armenia has no vast experience of accommodating such an influx of tourists within such a relatively short period of time as one week and in this sense the Yerevan mayor’s office has much work to do. “Because it is due to tourists that large amounts of money come to Armenia. I reckon that an additional $20 million enter Armenia due to Nowruz,” says the expert. Visiting tourist Zakhari, who plans on opening a travel agency in his native Iran, estimates one Iranian tourist spends $700-1,000 on average during a trip to Armenia. Zakhari and his friends had Armenian brandy bottles in their bags as they spoke to ArmeniaNow. They confessed they could not take those brandies with them to Iran, but added that instead they would have time to enjoy the drink while still in Armenia.